Build a custom garage for your car, boat or the family RV! backyard shed, tool shed or mini-warehouse. Crown International Steel Building Systems® is the leading manufacturer of quality pre-engineered steel buildings. With four versatile building types to choose from and your choice of color combinations, you are sure to find the right steel building for virtually any application. With over 40 years of experience, Crown Steel Buildings®engineering professionals use the most up-to-date technology to design each building model with the user in mind. Each building model is designed to go up fast and easy using durable steel and corrosion free hardware that requires no special tools to assemble. Our clear span buildings have 100% useable space to create the ideal storage solution for your home or business. We strive to meet the design specifics and budget for any for any agricultural, residential, commercial or industrial application. Crown International Steel Building Systems® go up easy! Each building model is made using Galvalume® steel, a steel alloy developed by the steel industry to provide lifelong durability. Your new steel building is backed by a 40-year limited rust-through perforation warranty on the AZ55 Galvalume® panels and a 40-year limited paint warranty. The arch-shape of the roof in each building model is designed to channel wind and snow away while retaining its great strength. Our metal buildings are an easy and economical way to build. Crown Steel Buildings® is dedicated to building a superior steel building system. We provide quality customer service from concept to completion to ensure each customer will be happy with the end result of the metal building for year’s to come. You can rely on the experience of our staff to guide you through each step to create a unique structural design to fit your needs and have your steel building erected in no time! Our goal has always been 100% customer satisfaction. All steel buildings are designed and tested to the highest standards of quality, ensuring compliance with all applicable building codes. And, direct factory assistance is only a phone call away. Some customers want their new metal building yesterday and others are planning months ahead. In all cases we are able to help you with purchasing and delivery times that work for you. The Do-It-Yourself building, process means that you are in control of when and how quick your building goes up. Say goodbye to scheduling a contractor, whether it's a Steel garage kit or Workshop Buildings – 3 good buddies and a weekend is all you need! Crown Steel Buildings, Metal Buildings and Prefabricated Buildings are designed for a broad range of residential and commercial applications including Garages, Workshops, Carports, Agricultural Storage, Metal Barns, Quonsets, Airplane Hangars, RV Storage, Roofing Systems, Storage Buildings, Military Buildings, Government Buildings , Commercial Warehousing, Metal Sheds, Hay Storage, Affordable Steel Housing, Salt Storage, Batting Domes, Animal Loafing Sheds, Athletic Facilities, Bus Stops, Doggie Dorms, Correctional Facilities, Industrial Storage, Pole Barns, Pole Sheds, Machine Sheds, Shop Buildings and all types of steel buildings! Our Factory is CAN/CSA A660-04 Certified!!! 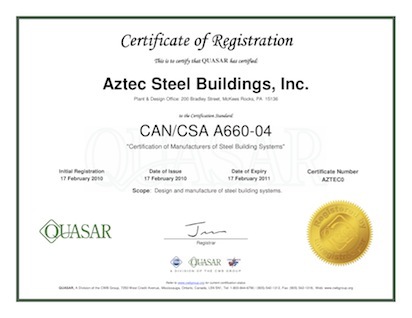 Aztec Steel Buildings has recently obtained a CSA-660 Quality Certification for Steel Building Systems.